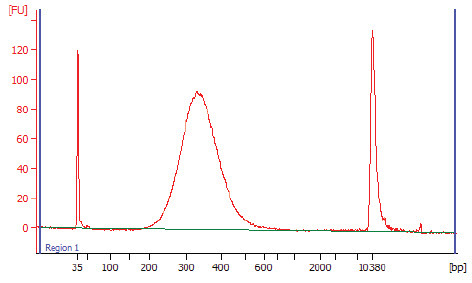 Add 90 µl (0.9X volume) of AMPure XP Reagent to the sample and mix by pipetting up and down. Pulse-spin the tube and place in a magnetic rack for approximately 3 minutes until the beads have collected to the wall of the tube and the solution is clear. Keep the tube on the magnet and add 200 µl freshly prepared 80% ethanol. Incubate 30 seconds, and carefully remove and discard the supernatant. Remove the tube from the magnet. 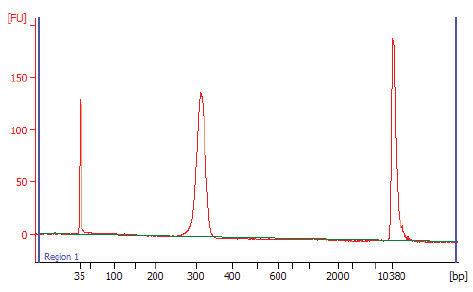 Resuspend the beads in 35 μl of 0.1X TE and incubate for 2 minutes at room temperature. Pulse-spin the tube, return to the magnet until the beads have collected to the wall of the tube and solution is clear. Transfer approximately 30 µl of supernatant to a fresh tube. Be careful not to transfer any beads. Dilute 2-3 μl of the library 1:4 in 0.1X TE. Assess the library quality on a Bioanalyzer. 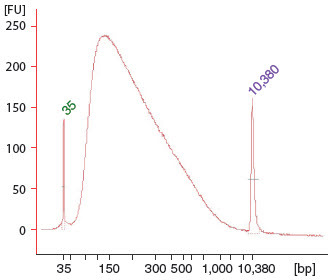 Figure 1.1: Relative size distribution of Fragmented End Repaired DNA as seen using the Bioanalyzer® 2100 (Agilent Technologies, Inc.). 1 μg of E. coli DNA was fragmented and end repaired for 20 minutes at 25°C, followed by 10 minutes at 70°C. Figure 1.2: Final Library Size distribution using E-Gel Size Selection. Figure 1.3: Final Library Size distribution using AMPure XP Beads.